Chaman: With Pakistan cracking down on unregistered Afghan refugees in the border provinces, even locals are finding it hard to obtain identity papers as authorities stiffen rules and procedures. Following the terror attack on an army school in Peshawar that left around 140 people killed, most of the children, the authorities have come down hard on Afghan refugees on the suspicion that refugee camps and settlements harbor terrorists under the guise of refugees. Even the recently introduced ‘computerized identity cards (CNIC)’ that are otherwise quick to obtain now take months, causing anxiety in the border town of Chaman where refugees are often hard to tell apart from locals. 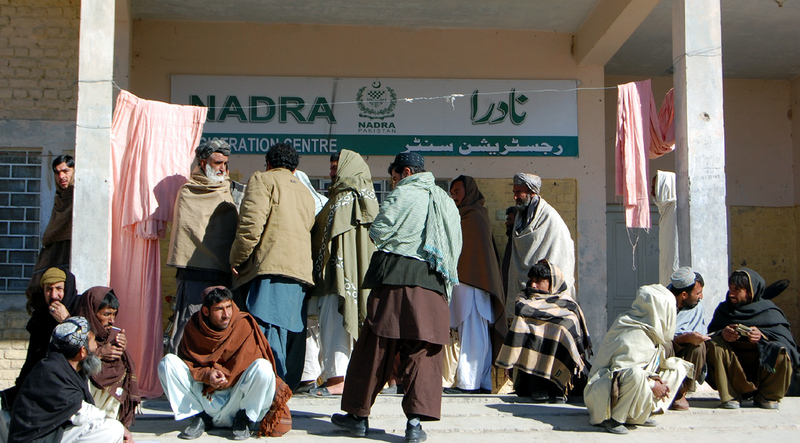 People wait in long queues outside the office of the National Database and Registration Authority (NADRA) in Chaman, complaining of delays. Women stand in a different line waiting to get themselves registered. The authorities suspect the local Pashtuns who have blood and ethnic bonds with Afghans across the border may be helping the refugees, posing that they are family numbers. Or Afghan refugees pretending they are locals. Niaz says he was informed by the NADRA office that someone in his family had applied for CNIC, showing themselves as his brothers when actually they were not. The ID cards of his entire family are now blocked owing to this fraud. None of the family members can process their CNICs. “It is only the Pashtun nation whose cards are blocked by NADRA under rules different from the rest of the country”, said Abdul Qahar Wadan, provincial vice president of the Pakhtunkhwa Milli Awami Party and an elected member of Pakistan’s National Assembly from the Qila Abdullah district. Shah Jahan, a local of Chaman, told News Lens that his father had passed away in 2004 but someone else was using his card by pasting a photo on his father CNIC. “Thank God I inquired and presented my father’s death certificate ten years after his death at NADRA office, otherwise we wouldn’t have known that my father’s CNIC was being used by another person”, said Shah Jahan. “They may even use it for criminal purposes.”. Shah Jahan is not alone. Many visitors at the NADRA office complained of “fraud cases” and delay in the processing of their CNICs. The NADRA official website mentions Documentation Requirements for a CNIC as: “Birth Certificate or Old NIC or Matriculation Certificate [for literate only] or CNICs of immediate/blood relatives or Citizenship Certificate issued by MOI [ministry of interior]. No documents are demanded from illiterate applicant for age verification for first time”. News Lens tried to speak to the officer In charge of the NADRA office, Jillani, but he refused to talk to media. Nazir Ahmad, a local, said it was only a matter of money to access an illegal card way but genuine document-holders were facing difficulties and forced to pay bribe. Nazir Ahmed, 42, says he has been approached by agents several times asking if he wanted a CNIC card for money. Donning a white turban, Mullah Muhammad Umer, 30, said he had complete documents wanted by NADRA but his CNIC was still not processed.